Bettors know all about both Texas coach Tom Herman as an underdog and the SEC runner-up letdown spot in bowl games, but the stats point to a dominating Georgia win in the Sugar Bowl as 12.5-point favorites -- if they show up motivated and that is the million-dollar question. Bettors know all about Texas coach Tom Herman as an underdog and the SEC runner-up letdown spot in bowl games but the stats point to a dominating Georgia win in Tuesday's Sugar Bowl as 12.5-point favorites -- if they show up motivated. That is the million-dollar question. Georgia coach Kirby Smart, who has led the Bulldogs to a 19-9 ATS record, is saying all the right things after his team fell apart to Alabama, 35-28, in the SEC Championship game. He told reporters the only focus is Texas and not being snubbed from the College Football Playoff, although [his players took to Twitter](https://sports.yahoo.com/georgia-players-take-twitter-complain-selection-committee-playoff-blowouts-031958308.html) to shine a spotlight on Notre Dame's poor performance against Clemson. Does that mean we'll see an angry Georgia team against a statistically mediocre Texas squad or will the SEC lay another egg in a New Year's Six bowl after losing in the conference title game? Georgia has covered its last five playoff/bowl games but the SEC runner-up curse [is real and](https://www.actionnetwork.com/ncaaf/georgia-texas-betting-odds-pick-sugar-bowl-2019) the Bulldogs will be without star cornerback Deandre Baker. How much will it matter against a Longhorns unit that ranks 72nd in passing explosiveness and 86th in big-play rate remains to be seen but the Bulldogs rank-out better statistically in nearly every S&P+ category. Bettors will have to decide do they want to put their money on Herman team's improving to 13-2 ATS as a dog since 2015 or are they going to trust in statistics and an SEC defense the likes of which the Longhorns haven't faced all season? ## Texas vs. Georgia Sugar Bowl ATS pick Personally, I trust the advanced metrics in this spot and believe Georgia will show up with something to prove. Texas has thrived under Tom Herman twice against Oklahoma this season and basically covered in the Big 12 title game but Georgia's SEC defense is a different animal. Texas' non-explosive offense has scored 27 or fewer points the past three games against Kansas, Oklahoma and Iowa State. While the Longhorns could have success on the ground against Georgia's 81st ranked rushing efficiency defense, that's not going to help them keep pace on the scoreboard. # 2018 college football bowl game odds for New Year's Day ## Sugar Bowl betting lines, odds and prediction 7:45 p.m. CT on ESPN from New Orleans ### Texas vs. Georgia Sugar Bowl odds __Point spread:__ Georgia -12.5 __Total:__ 59 __Betting line movement and games notes:__ Georgia opened as an 11-point favorite at the Westgate and the point spread went as high 13 before settling on 12.5 on Monday night. The total has increased just one point from opening at 58. 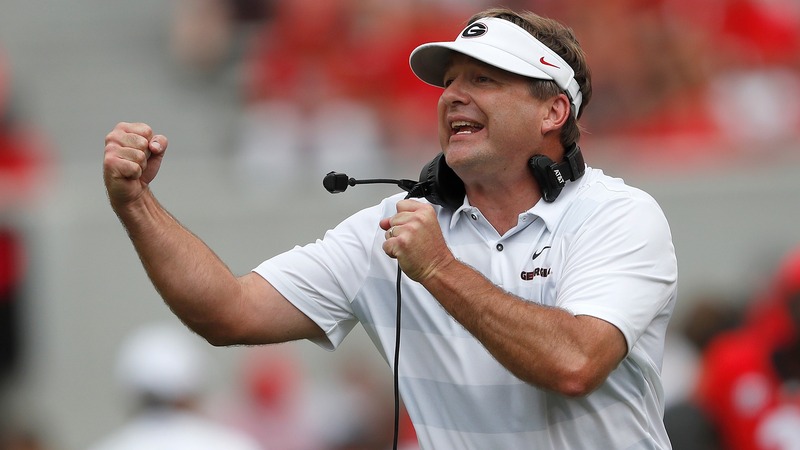 Roughly 58 percent of bettors are backing the Bulldogs ATS and some sharp money has appeared on the SEC runner-ups at offshore sportsbook BookMaker earlier in the month. __S&P+ prediction:__ Georgia 40, Texas 22 __Note:__ S&P+ rankings are an advanced data set of tempo- and opponent-adjusted components of the five factors of college football: Efficiency, explosiveness, field position and finishing drives. Per creator Bill Connelly, a fifth factor, turnovers, is informed marginally by sack rates. __Play and win:__ [Join our free contests](https://betchicago.chalkline.com/) ## Texas football betting records, stats 2018 SU record: 9-4 2018 ATS record: 5-7-1 2018 O/U record: 6-7 S&P+ rank: 36 Off. S&P+ rank: 28 Def. S&P+ rank: 55 Special Teams S&P+ rank: 63 ## Georgia football betting records, stats 2018 SU record: 11-2 2018 ATS record: 8-5 2018 O/U record: 6-5-2 S&P+ rank: 3 Off. S&P+ rank: 3 Def. S&P+ rank: 16 Special Teams S&P+ rank: 27 __MORE:__ [College Football Playoff Odds Shopping](https://www.betchicago.com/odds-shopping-college-football-playoff-alabama-clemson) ## Texas vs. Georgia Sugar Bowl betting trends Bulldogs are 7-3 ATS in their last 10 non-conference games and are 19-7 ATS vs. a team with a winning record. Bulldogs are 7-0 ATS in their last seven neutral-site games as a favorite. UNDER is 8-2 in Longhorns' last 10 games as an underdog of 10.5 or greater. Longhorns are 13-6-2 ATS vs. a team with a winning record.